In a new New Yorker profile of Vice President Mike Pence, reporter Jane Mayer sheds light on the relationship between President Donald Trump and his second-in-command. Mayer framed the story, titled "The Danger of President Pence," around the idea that despite growing support for Trump's impeachment, Pence's sometimes ultra-conservative views make that a dark prospect for the liberals that oppose Trump. Mayer cited a longtime Trump associate as saying the president likes to keep Pence in check. Mayer reported that Trump often mocks Pence's conservative views, like his desire to see Roe v. Wade, the Supreme Court decision that effectively granted women the right to abortion, overturned. 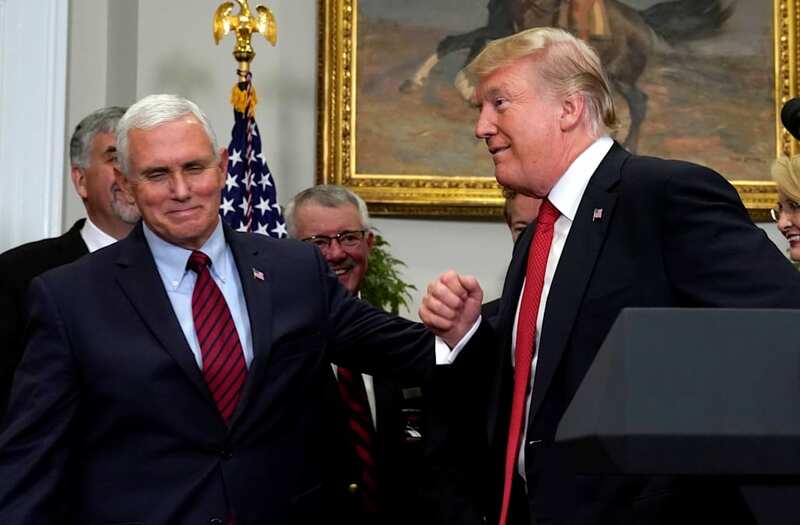 When a legal scholar pointed out to Trump and Pence in a meeting that even if the case was overturned, many states would legalize abortion on their own, Trump ribbed Pence, according to Mayer. "You see? You’ve wasted all this time and energy on it, and it’s not going to end abortion anyway," Trump said, according to Mayer. Mayer reports that when the topic of rights for gay US citizens came up, Trump pointed to Pence and said, "Don’t ask that guy — he wants to hang them all!" Even the social conservative Trump mocks Pence's old-school ways, according to Mayer. When visitors come to see Trump after meeting Pence, the president will ask, "Did Mike make you pray?" Read the full profile at the New Yorker here.